Let's continue our detailed discussion of Knights of the Fallen Empire's individual chapters. We're almost through the initial batch by now. Needless to say, there will be spoilers. Click here to go back to Chapter 6. 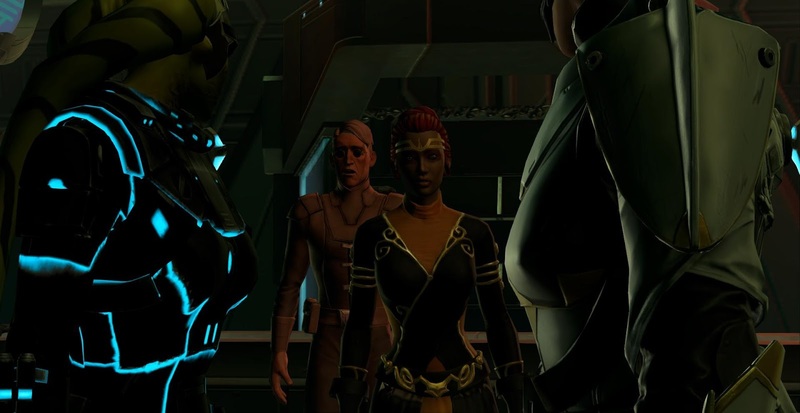 Senya's revelation that she's the mother of Valkorion's children gets your companions riled up - Koth in particular doubts her motivations even more than before. 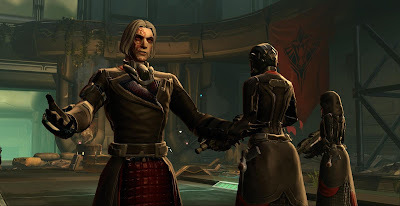 Since it's also out in the open now that Valkorion is in your head, this also brings up the question of what to do about him - Koth wants him back on Zakuul's throne, while Lana still wants to see him eliminated for the atrocities he committed on Ziost and elsewhere. Before you get to shuttle off to Zakuul, there is a brief intermission as a minor power outage is affecting the hangar doors. You replace the broken fuse but find out that a whole bunch of flappy things from the swamp have infested certain areas of the ship and are causing technical problems. HK-55 is highly enthusiastic about getting to clean them out. Eventually you and Senya make it back to Zakuul, to the so-called Old World, where you meet up with T7 again. If you let her, Senya also talks a bit about her relationship with Valkorion and the children, how he became distant over time and how Vaylin in particular was trouble from the start, but if you've heard it all before you can also ask her to just move on. Interestingly, this is the first time we see Thexan getting mentioned in-game, but somehow your character already knows about him or at least doesn't get the option to ask what happened to him. 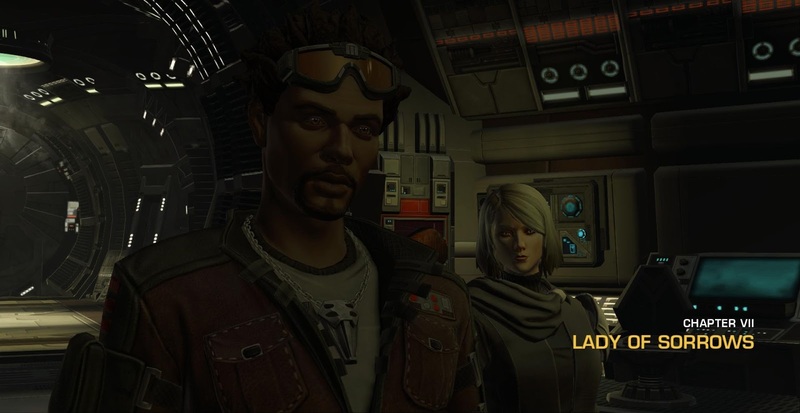 Senya also says that he was "killed in the core worlds", showing that the true story isn't publicly known. You sneak through the service network of the local Undercity while disposing of some of the indigenous wildlife on the way until you come out at a tram station. (Oddly, both times I played this chapter lately, I got kicked out of the instance at this point and had to load back in from the fleet to continue.) HK radios you to keep you updated about his progress exterminating the remaining vermin on the Gravestone. Eventually you reunite with T7 as well as with Senya, who messages you that she could use a hand. She's in a cantina and being assaulted by some so-called Heralds of Zildrog, a cult of snake-worshippers. (Incidentally, while the group only consists of two weak mobs and a silver, these guys actually managed to kill one of my alts - shock! It's probably because Senya doesn't technically act as a companion in this fight.) Once they are taken care of, Senya sets to interrogating an old acquaintance of hers called Reg who appears to be the barkeep - and she's neither afraid of using force nor The Force. Eventually he says that he doesn't know where to find the Lady of Sorrows but directs you towards a data broker called Mona Gale who supposedly does know. A quick cut to the Eternal Throne shows Vaylin reporting to Arcann that both the Outlander and their mother are back on Zakuul. 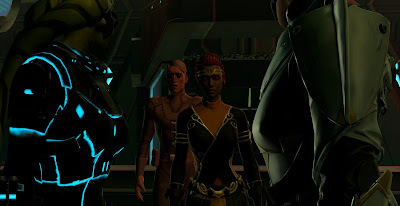 Arcann is actually sufficiently intrigued that he tells her to let you finish your business, whatever it is, though he has a plan to make sure you don't "dawdle". You and Senya make it to the aforementioned information broker, who takes bets for arena fights and has no intention of telling you anything. Just as she declares this, your conversation is disrupted by a broadcast from Arcann that the Outlander is on the loose with a rogue knight - two very dangerous individuals! You are treated to a great shot of you and Senya turning around and both the data broker and her last customer gazing at you in terror. The former says that she doesn't know how to find the Lady of Sorrows either, but that you should have better luck with the Heralds of Zildrog in Breaktown - "the underbelly of the underbelly" according to Senya. Shortly after you leave, T7 witnesses Mona Gale being harassed by two masked Heralds that want to know where you went, after apparently having killed your previous contact Reg. Meanwhile, HK regales you with more tales of successful ship-cleaning, explaining how much time he's saved by directly applying the industrial cleaner to the animals instead of killing them first and mopping up later. It's a shame the lighting is so bad in this scene, otherwise it's a great shot. Koth argues that Senya, being a knight, will ruin any chances of negotiating with the Heralds' leader, who calls himself the Exalted. You get to choose whether Koth or Senya gets to accompany you inside. However, in the end it doesn't matter, because even if you negotiate well, the Exalted says that prophecy hasn't forseen you defeating Arcann, so he can't side with you. Just as he's about to have his minions open fire on you, a hologram of a Nautolan appears, speaking for the Lady of Sorrows. She is displeased that the Heralds have killed Mona Gale and shows imagery of the Exalted's son being held hostage. She has also captured whichever companion you left outside and has them say that they are unharmed and that the Lady wants to meet you. After one last reminder from the Nautolan that the Heralds are not allowed to kill the Outlander... the Exalted orders his minions to kill you anyway, before setting off to get his son back from the Lady of Sorrows. Of course, you being you, you kill them instead and then proceed to where you are supposed to meet the Lady, a place called the Razor. On the way, you kill some more cultists and run into two Knights of Zakuul, one of whom is Novo, the guy who ran away from you in chapter three. He blames you for his partner's death even if it was Vaylin who killed him. After giving them a thorough beating, you get the option to tie them up or kill them. Finally you arrive at the Lady of Sorrow's headquarters, expecting to end up in the middle of a fight between her and the Heralds... however, as it turns out she's already offed them all and is just finishing off the Exalted himself. Oh, and she's no other than Scorpio, killer droid companion of the Imperial agent. It turns out that the Exalted's son wasn't really her prisoner either but that he agreed to lure his father into a trap so he could take his place. If you're an agent, the dialogue with Scorpio is slightly different as you obviously recognise each other, but it's not particularly warm either as she never really liked you. If you ask about the other agent companions for example, she comments laconically that she had no reason to care about them after your disappearance. Scorpio agrees to accompany you to the Gravestone because she wants to communicate with the ship, hoping to finally find an intellect that rivals her own. She also admits to carrying a grudge against Arcann because he has something of hers, though she doesn't explain what it is. The player is however given the answer via a shot of Arcann on the throne, issuing commands to the Eternal Fleet... and the command unit appears to be an AI not dissimilar to Scorpio herself. On the plus side, both Zakuul and several of your companions gain some additional depth here. You get an idea of the planet's underworld, and the Heralds of Zildrog are another fun little sub-faction to throw into the mix (plus they provide another excuse to fight something other than skytroopers). It remains to be seen whether they will have any further significance as the story goes on. You get a chance to hear more about Senya's backstory and get to see her in action while chasing down the Lady of Sorrows - she's revealed to be quite an interesting character, because even though she claims to stand for order and justice, she's actually quite ruthless and sardonic. Finally, let's not forget that this chapter also has some pretty strong humorous moments. I wasn't too thrilled by the reintroduction of Scorpio as a main character as I never particularly liked her, however you're at least quickly given a reason as for why she might be important (the Eternal Fleet operating under a similar sort of AI). The only thing I still don't know is why she's actually called the Lady of Sorrows on Zakuul. It seems way too sentimental a name for her to choose for herself, and based on what we've seen of the Zakuulan underworld, there's no reason to assume that she causes any more sorrow for the people than other shady characters on Zakuul. What's wrong with KotFE's combat? Is KotFE Keeping You Engaged?